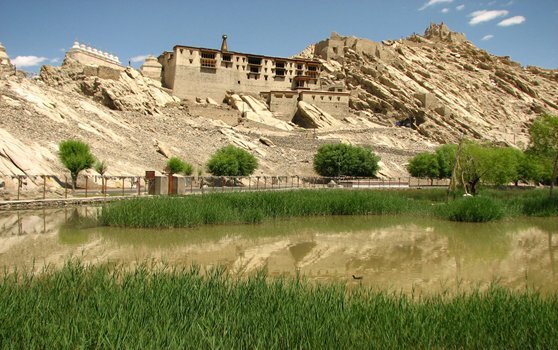 Thikse Monastery: Experience Spiritual Bliss! Situated at a distance of about 18 kilometres by road from Leh, Thikse Monastery is the largest monastery in central Ladakh district in Jammu and Kashmir. The architecture of this monastery is spectacular and it is huge, with a 12-storeyed structure! The monastery is home to 10 temples and an assembly hall. It houses about 120 monks and also has a nunnery. If you look forward to a divine, spiritual experience amidst breathtaking views of spectacularly wonderful surrounding landscape of Ladakh, Thikse Monsatery is the perfect place for you to visit. The serene ambience of this place makes it great for meditation! Inside the main Gompa, there is a 14-metre-high Buddha statue covering two floors. There is an interesting story behind why the monastery was built at the spot where it is situated. It goes like this: Jangsem Sherab Zangpo and his disciple Palden Sherab were offering prayers with a ritual cake at a distance of about three kilometres from where the monastery is presently situated, when a crow suddenly picked up the cake and flew away. Upon searching, they found the cake in perfect order at the top of a hill. They considered it to be an auspicious spot and thus made Thikse (meaning perfectly in order) monastery there. If you wish to stay here to experience the interestingly unique culture of Tibetan Buddhism or for spiritual reasons, you will be delighted to know that the monastery provides accommodation to the visitors at very reasonable rates with excellent services! A restaurant is also there in the monastery itself, serving only vegetarian food. As with the rest of Ladakh, best time to visit Thikse monastery is between May and September, as routes are closed for the rest of the year due to heavy snowfall. General weather of this destination is Cold. This destination is of type Mountain.